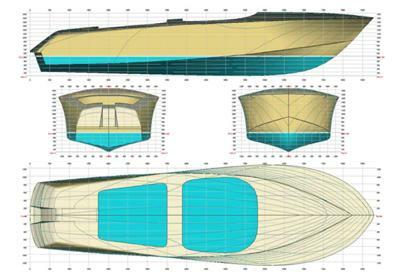 I have the plans of my boat (is my first attempt at making a model boat) and I can't figure out a way to make the ribs. How do you figure out the shape of the ribs? (the boat i am trying to make is the Riva Aquarama). First of all, that is not an easy boat to build for a first attempt. You may want to consider something a little easier for your first attempt. Look for a subject with a flat deck that can be laid flat onto your building board or table. The Riva Aquarama is an attractive looking boat, but there are no flat surfaces, so it will be difficult to keep the boat straight and true without utilizing advanced building techniques. Secondly, I'm confused, it seems to me the plan you have has all the lines you need. The ribs are marked on the front and rear view (or properly called sections). what you would need to do is copy and/or print out as many copies of the sections as there are ribs, those sheets now become your templates. Next you trim off some of the paper on each, number them, and temporarily glue them to the wood you're using. Then you can cut the wood to the outline of each respective rib.